February 15th, 2013 already is a historic date: out of the blue, a meteorite exploded in the earth’s atmosphere above the Russian region of Chelyabinsk. The massive shockwave destroyed countless windows and buildings. About 1,500 people were injured, in most cases by glass fragments. The same day, the 40-meter asteroid 2012 DA 14 passed the earth in a distance of only about 26,000 kilometers – the closest fly-by scientists ever recorded. These two events were not linked to each other – which only points out the menace of meteorites hitting our planet. Meteorites are ambiguous. As shooting stars they are messengers of good luck. But as massive missiles they spread fear of death and destruction. In the planet’s history, there have been numerous impacts with cataclysmic consequences. 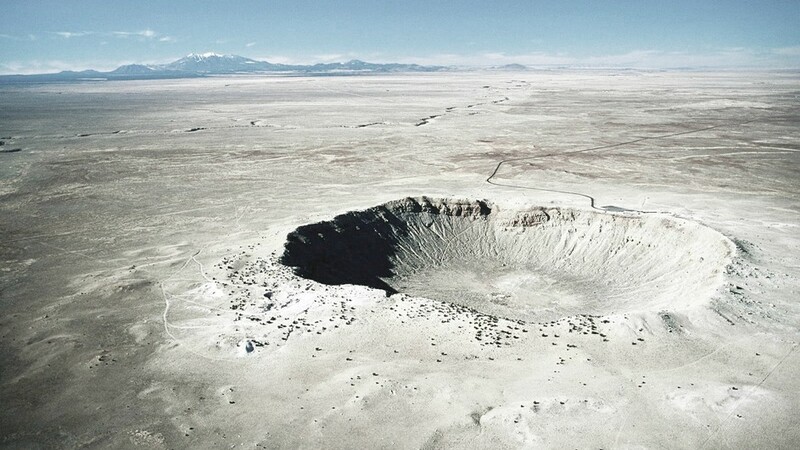 The best-preserved meteorite impact site is Arizona’s Meteor Crater, caused, some 50,000 years ago, by an iron slug 50 meters in diameter. Even better known is the so-called ‘dino killer’, a meteorite that hit Mexico’s Yucatan peninsula some 65 million years ago and is held responsible to the demise of dinosaurs. In order to spot such dangerous heavenly bodies at an early stage, scientists have developed monitoring programs based on special telescopes – like Pan-STARRS, an observatory located on Mount Haleakala, Hawaii. Here, the scientists discovered 19 near-earth asteroids, or NEOs, in January 2011; the most asteroids discovered by one telescope on a single night. Scientists rack their brains about how to fend off a potential disastrous impact. Ideas range from solar sails or special ‘tractor’ spacecraft that could deflect approaching meteors from their collision course to blasting them with nuclear missiles. Most meteorites are fragments of asteroids – leftovers from the genesis of our solar system some 4.5 billion years ago. They contain crucial information about the way the planets and other heavenly bodies in our solar system came to be. Better still, researchers have found numerous substances in meteorites that are regarded as preliminary stages of the organic compounds on which life is based. This means that meteorites may have played a part in the creation of life, providing a sort of start-up aid to evolution. Again, their involvement in both life and death makes meteorites ambiguous. State-of-the-art computer graphics, spectacular meteorite videos, on-location sequences and expert interviews add up to a comprehensive portrait of these celestial bodies.